Set up in 2002 by Lucien Nicolet AKA Luciano, Cadenza Music has grown to embody the spirit and ethos of modern electronic dance. With a dazzling array of international events from the Cadenza Showcases and Vagabundos parties, to the international family of artists, DJ's and promoters, and with over 80 singles, albums and compilations under its belt, Cadenza continues to stand tall after a decade of dance unity. Through the good times and the bad, Cadenza now boasts a truly diverse international roster of artists, from Reboot to Technasia, Kenny Larkin to Argy, Mirko Loko to Michel Cleis, and many more – all of who capture the often spiritual, but always grounded electronic dance sounds of the past, present and future. 2013 will be a year to look to the future whilst rejoicing the present. Alongside our continuing commitment to new music, our artists will be collaborating on special music projects that capture their journeys so far. We will be inviting friends and fellow artists to release and remix on the label, and our Vagabundos brand will see some of the artists release their mix compilation albums throughout the year. As well as the music, the visual element of Cadenza has always been something very close to Luciano's heart and key to the labels identity… So in this, we will be showcasing the Art at intimate events in art gallery environments around the world, sound tracked by our DJs. Last but not least, our events will be coming to all four corners of the globe, in a ritualistic celebration of dance and music, to come and join together with the fans and followers who have helped Cadenza on its beautiful journey so far. We look forward to uniting with you and hope you will join in this, our special anniversary year. 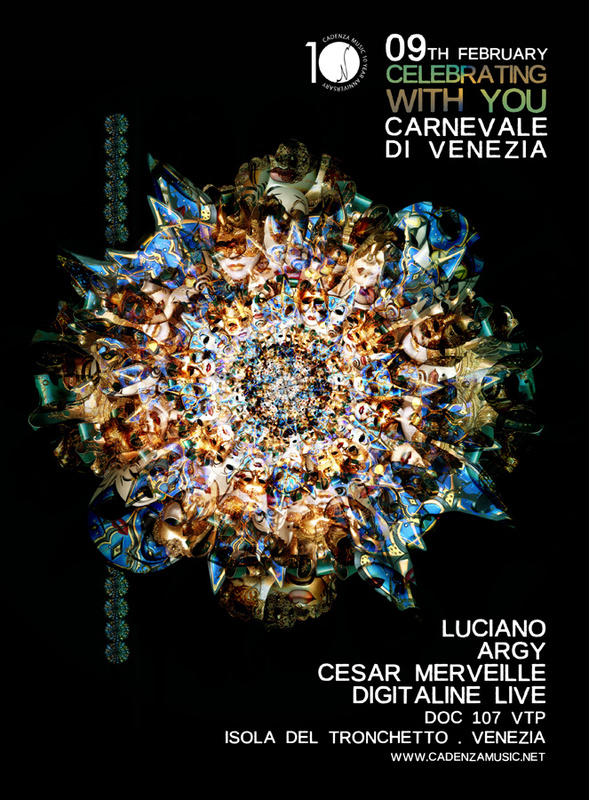 Di Venezia, (Venice, Italy) with Luciano, Argy, Cesar Merveille and Digitaline live.